I don't feel like talking these days. Words seem such a waste of time and effort! And worst of all, 99% of the time, we don't even say what we intend to or wish to communicate! Until a few months back, I always kept wondering why my dad said all those horrible things to me when he disagreed with me on something! I wondered why we couldn't just talk calmly like two mature adults, who love each other and know that they'll always continue doing so, but who are having a minor difference of views at the current time! And then suddenly one day I started getting these feelings that while he was shouting at me and saying all kindsa crap things... he actually meant something totally different! As if there was another completely different channel of communication between us! In fact, I found myself telling him - "Why can't you simply say that this is what you mean? What's the purpose of saying all those nasty things? All that crap isn't going to help me understand your point of view!" This started happening more often gradually. Instead of getting caught up in the argument with him, I found myself being able to pin-point exactly what he was trying to say, even though he never actually got around to saying it! This was getting to be a bit spooky you know, 'coz he himself wasn't usually aware of what he actually wanted to say! Oh yeah... he's always been like this... he's simply terrible at communicating with people! He'll always ALWAYS say JUST the WRONG thing... that will worsen the situation even further! It's as if there is a total lack of coordination between his thought process and his verbal expression! But hey mind you... whatever problems he may have with his communication skills... he is actually at a very high level of evolution! A very VERY high level! Yeah, it took me almost 30 years to realize this fact! Sighhhhhh! But nowadays... when I've started communicating directly with his "mental process" (instead of listening to his meaningless "words"!)... I have only begun to realize how advanced he is in his thoughts and level of understanding about the laws of nature! I guess he just comes from some place where they didn't really need words to communicate! You know... like babies are also able to communicate with their moms without words! So wordless communication is definitely possible! I wish we could all start communicating without words. 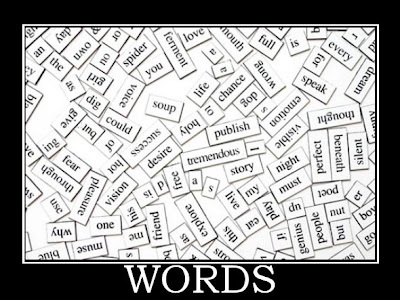 Words generally create more trouble than good! Because majority of the human species has no clue how to express themselves in words correctly! And now that I'm more and more able to pick up on people's thought waves, this becomes very confusing! Because people NEVER say exactly what they mean! It's like words are always belying the actual feelings and thoughts that are being communicated intuitively! Actually, I have been able to pick up on "things unsaid" earlier too. This has happened before several times in fact, when a person's words would say something, but my "thought-sensors" would be intercepting a completely different story! And well, living in such a "word-dominated" dimension, we obviously tend to give more weightage to what is being "said" rather than what is being "received intuitively"! Can be disastrous! HAS BEEN disastrous! I wish they would just do away with words altogether! So we'd have no choice but to rely on what the "subtle forces" are conveying us! (Just imagine guys... you wouldn't have to worry so much about coming up with original "pickup lines" or "ice breakers" or "sentimental love letters"... or whatever!) Life would be so much "less complicated"! Sighhhhh! WELL ..FINALLY CONGRATS!!! I must admire that you actully bothered to put these things in words. I have been like this ..not wanting to talk at all A LOT especially these "MAUNA Bouts" as i call them for my self have been so much frequent in past 2 years. However This year gone by you have made me talk much more than anyone else.And you being in this state of Scilence and Vairagya Seriously makes me SO MUCH happier. This too happens. But hey dont forget "This Too shall PASS." And BTW yeah ..THIS was also ONE of the reasons i was not blogging. apart ofcourse from being lazy. Sometimes this form isn't always correct however, and many times I have been misinterpreted via this form of communication. Communication on all levels is the key! I went on a "phone strike" during the summer so I know taking a sabbatical can clear you head. My parents used to yell and say hurtful things like your father...bec their parents did the same and so on. The key for this is as we have recognized it so young we know not to communicate verbally in this manner. We "untrain" ourselves all of the negative doings that has been passed on. When we do this we become better communicators and better listeners in all forms.